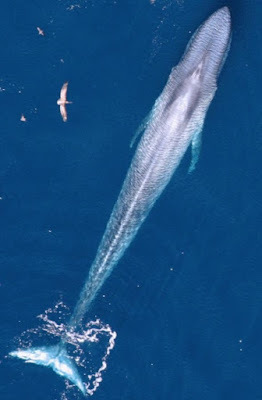 Kind of hard to believe that such a huge critter like the blue whale eats little shrimp-like creatures called krill, and they eat a lot of them every day. The whale does this like a giant scoop, swallowing enough water to fill a swimming pool, then closing their mouths under all that pressure. It blasts out the water through blowholes. Whales are mammals that breathe air, so they come up to the surface for that as well as blowing out the sea water. This made them targets for whalers, who brought them to the brink of extinction in days gone by. According to evolutionary mythology, life went from the sea to land, and mammals like this went back to the sea. The Charles Darwin Club Secret Decoder Ring© inadvertently reveals that this is strictly guesswork based on evolutionary presuppositions; they do not have evidence for this process. They also have a very loud sound that puzzles scientists, since they can't find the mechanism for vocalization. Don't be expecting to hear it, because it's usually below human range. Going further, there are many specialized mechanisms for the whale's survival (including the one to close its mouth while scooping a watery lunch) that defy explanation through mutations, time, chance, natural selection, and so forth. No, this is yet another example of the Creator's design in action. What is the largest animal of all time—even larger than the most massive dinosaurs? The answer is the blue whale. These giants average about 70 feet in length, although some were reportedly more than 100 feet long during the whaling era. That’s about the length of three school buses! While some dinosaurs were longer from nose to tail, the blue whale still tops them in sheer bulk. Blues weigh around 200,000 pounds (100 tons), while the largest land mammal today is the African bull elephant, which may weigh eight tons. If the blue whale lived on land, its skeleton would collapse under its weight. But the blue whale’s home is the vast ocean expanse, where the water’s buoyant force supports its bulk. To finish reading, click on "Blue Whale: The Mammoth of the Sea". You may also like this article on fanciful stories falsely presented as science, "Whale of a Tail Tale".